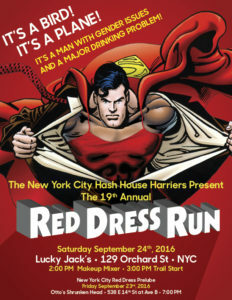 The New York City Hash House Harriers announced the details of this year’s annual Red Dress Run weekend. Events are planned from Friday Sept 21 through Sunday Sept 23. Finally legal, this will be NYCH3’s 21st annual Red Dress. New York City’s Red Dress Run is always a blowout. There’s nothing – well, precious little – to compare to red dress hashing through high traffic tourist areas of New York City. This entry was posted in rdr and tagged new york, red dress run, usa on 2018-08-30 by treed. The New York City Hash House Harriers announced that the 2018 annual Red Dress Run weekend is scheduled for September 21 – 23rd 2018. This is NYCH3’s 21st annual Red Dress. This entry was posted in events, rdr and tagged new york, rdr, red dress run, usa on 2018-07-15 by treed. 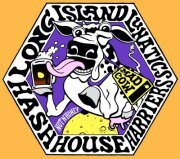 The Mad Cows of the Long Island Lunatics H3 are running their 69th trail, and want you to join them! The LIL is a relatively new New York City area hash, having had their inaugural run on May 6th, 2012. This entry was posted in events and tagged long island lunatics h3, new york on 2017-11-22 by treed. In 2016, a reporter from Outside Magazine hashed with a few of the New York City Hash House Harriers’ kennels. I met her; she was a pretty good sport, hashing in Brooklyn and the city, and taking her down-downs without too many complaints. 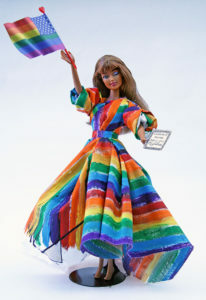 As is customary in New York City, she was not named. The article was published in one of the magazine’s Fall issues and is now available online. This entry was posted in about hashing and tagged new york, outside magazine, usa on 2017-01-17 by treed. 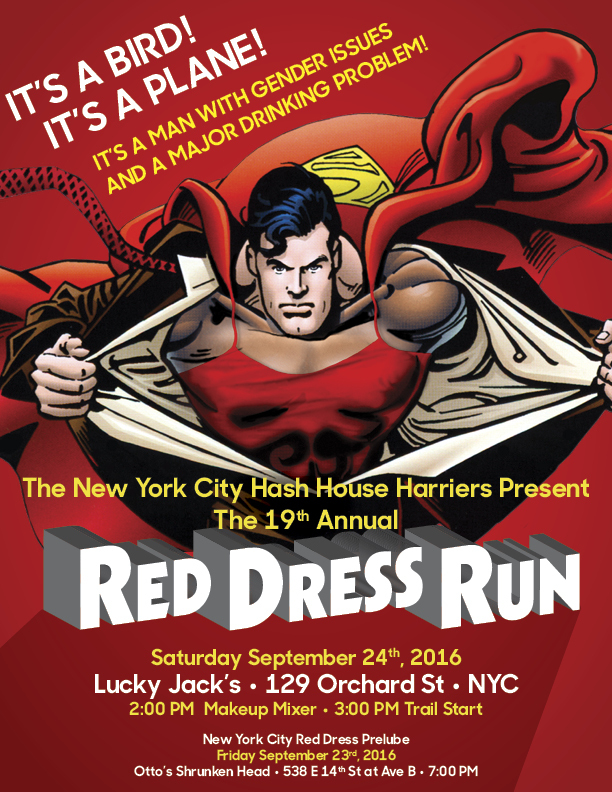 The New York City Hash House Harriers hosts its 19th annual Red Dress Run on the weekend of September 24 2016. Just like the city itself, the NYC event is always a raucous good time. The A to A trail promises lots of sights where hashers can simultaneously take in and be the scenery in the crowded city streets. This entry was posted in events, rdr and tagged new york, red dress run, usa on 2016-09-20 by treed. Registration fee includes Haberdashery, ID Tag, Pub Crawl, Trail Beer, Circle Beer, Food and Beer at On-In, DJ/Dancing. Haberdashery not guaranteed for any registrations received after August 1. Ithaca H3 has opened $99 rego on their web site now. This entry was posted in campout, events and tagged camping, ithaca, new york, usa on 2016-06-10 by treed. This entry was posted in events, rainbow dress run, rdr and tagged new york, red dress run, rochester, usa on 2016-06-06 by treed.